Electric Bike Kit News & How-Tos » GM uses E-BikeKit hub motors at the Pan American Games! Adam Boesel, inventor of the UpCycle Ecocharger, is using Electric Bike Tech hub motors and working with GM and Chevrolet to build bicycle generators featured at the 2015 Pan Amercian Games! Adam Boesel is using Electric Bike Technologies hub motors on bicycles that generate electricity! Now General Motors has taken his idea to the 2015 Pan American Games and is using them to show people how PLAY can literally turn into POWER. Adam Boesel created the UpCycle Eco charger years ago to power his line of power-generating bicycles he placed inside of this electric sustainable gyms, The Green Microgyms. The product has changed a bit since then but the technology and the idea behind it has carried on and been picked up by some powerful companies; most recently General Motors. Just this month, riders at the 2015 Pan Am Games, got the opportunity to compete in electric car races using power they generated by pedaling their UpCycle Ecocharger equipped bicycle generators. Each contestant pedals as fast as they can, generating increased power to the small race car. The cars go around the track until the person who generates the most energy wins the race. All the while the riders were actually charging Chevy Volt batteries! Adam has told us he is currently working on a demonstration UpCycle cruiser bike that will be at CES 2016 in Las Vegas Nevada! It also looks like Chevy is going for an official electricity generation world record! Learn more about the #PowerOfPlay project from GM and about Adam and the UpCycle Ecocharger. 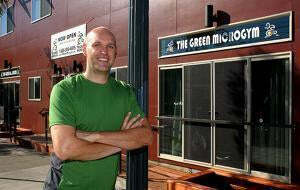 The Green Microgym and Plugout Technology were invented by Adam Boesel, a school teacher turned personal trainer who started up his first gym in Portland, Oregon in 2008. While writing a business plan for his gym, he thought, “Wouldn’t it be great if the members could make electricity when they are exercising?” He found that although there was a lot of speculation and experimentation about the idea, no one had started up a gym with Eco Fitness as their central focus.